Dr. Amit Shah, a Sugar Land native, received his bachelor of science in biology from the University of Houston in 1998 and followed up with his Doctor of Optometry degree in 2002 from the University of Houston College of Optometry. Dr. Shah is a therapeutic optometrist as well as an optometric glaucoma specialist and is passionate about preventative eye care. 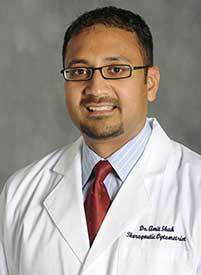 Dr. Shah’s emphasis is on routine eye exams including diabetic eye exams and the evaluation and treatment of glaucoma. He specializes in the treatment and management of eye infections and injuries, pre and post-operative cataract and LASIK care, and specialty contact lens fittings. Dr. Shah is an active member of the American Optometric Association and the Texas Optometric Association. In his off time he enjoys sports and traveling with this wife.